We bring joyous news for all MBA Graduates and even those who are pursuing it currently. If you are worried to know jobs for you than leave it on us. Here at Chekrs you can view the MBA Job Opportunities that enhance your career. The MBA Government Jobs options are many more and they can get a job in almost every department based on the work profile you want. The MBA Sarkari Naukri in majority of the departments is related to management, relation manager or information dispersing. If you are looking for any such work functioning in Government Jobs for MBA Freshers than here we have assembled all the possibilities which suit your eligibility criteria. Also some of the MBA Recruitment in PSU, ONGC, IOCL, BPCL, etc will be paid well for to comprehend your education level. If you are looking for MBA Jobs for Freshers in the private sector we can give you jobs which are best in the complete industry. Here you are viewed specialized Jobs after MBA and updates that lead you to access the proper details of knowing jobs. At Chekrs you can review more than 1000+ ongoing MBA Vacancy 2018 that places in top class companies. The candidates are also free to select the jobs as per their preference to work for MBA Vacancies in Pune, Chennai, Mumbai, etc. If you have felt satisfied from the above mentioned jobs and want to continue receiving MBA Latest Jobs updates than use the subscription of Chekrs. 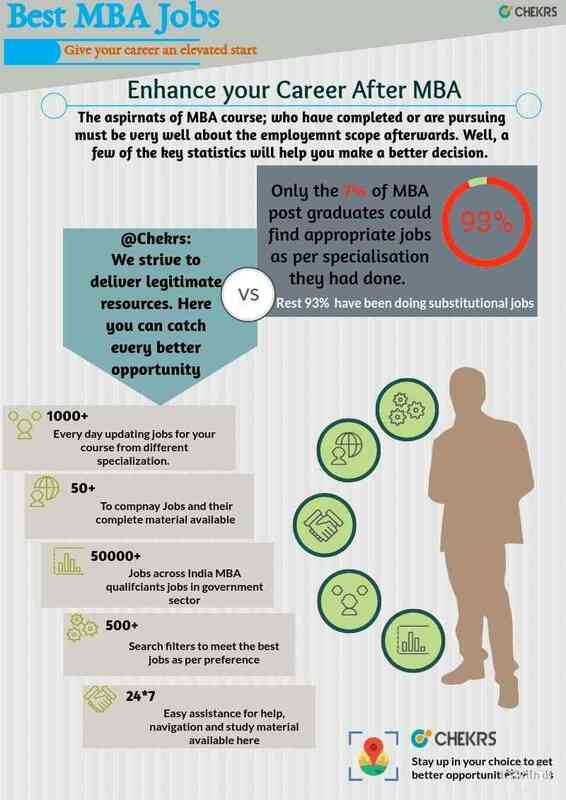 Why Chekrs for Latest Marketing Jobs for MBA Freshers? The Chekrs knows what exactly you aim for. While serving the same purpose we also ease your difficulty in chasing it we give access to preparatory tools as well. We provide the study material that can help you in the tough competition. Also you get the previous papers and model papers as per the vacancy you have applied for with comprehensive online tests and quizzes.